Dedicated professional business programs of instruction, research, and service. EOU’s innovative approach to the business degree allows students on campus and online to earn a degree that provides a successful career trajectory. Students learn about the functional areas of business and the analytical, communication, and interpersonal skills needed to apply that knowledge within society. Our business degree refines curiosity for life and learning, as well as an awareness of social responsibilities and the ethical implications from business decisions. Undergraduate tuition and fees average thousands less than other public and private institutions in our region. That’s a big difference, resulting in significant savings for you. Attending EOU provides the private college experience with small classes and personal connections at half the cost. 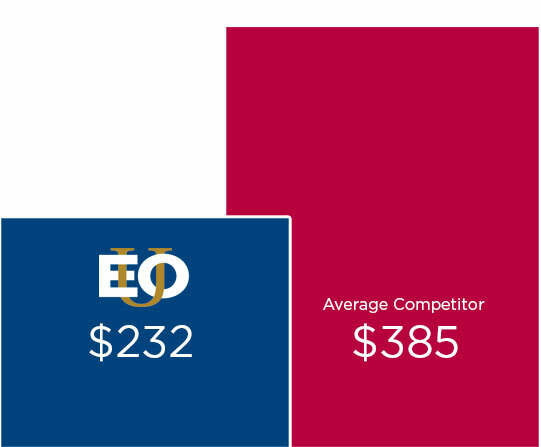 Realize the significant savings at EOU. We offer an accredited cost-competitive price for undergraduates. The total for student fees and tuition are unbeatable! Get the complete package by getting your Business degree from our main campus in beautiful La Grande, Oregon. A small class size ensures one-on-one support, both by faculty, and other wonderful student services. Top notch residential accommodations, friendly community, and access ALWAYS to the great outdoors. Complete a degree completely online. Also, onsite undergraduate classes are available at EOU Gresham with classes at Mt. Hood Community College; and at the EOU Hermiston center in partnership with Blue Mountain Community College. Onsite partnerships for webcast of the MBA program exist in Hermiston, Ontario, and Prineville currently. Our programs in Gresham, Oregon offer a live classroom setting primarily designed to meet the needs of adult-learners and transfer students residing in the Portland metropolitan area. Upon completion of the program, students will receive their degree from Eastern Oregon University. The MBA degree is the key to unlocking the doors of opportunity for a lifetime. Industry leaders respect the MBA as a sign that you are ready for greater levels of responsibility and compensation. Online, onsite, and on campus. EOU’s MBA is the best value in the Pacific Northwest! Taught entirely by full-time faculty at EOU. Our partnership with the Muslim Educational Trust offers on-site MBA classes in Tigard. Accredited Business Programs: Committing to quality standards and practices to ensure that students are prepared to move our communities forward. Programs in the College of Business are accredited by the International Assembly for Collegiate Business Education (IACBE).